Sources that are only relevant to one page will be found on that page. Sources that are only relevant to one family will be found on the home page for that family. Can bring tablet to library and can access my files and my website from my library desk. Can bring phone to library and take huge numbers of digital photos of documents, to read in detail later. Often on visits now, the main aim is to photograph, not to read stuff. Libraries in Ireland and in foreign countries publish material online, so I can research from home. This is all the norm for people growing up now. But it is a wonderful dream for people like me who started researching in the 1980s. Copac - Combined catalog of UK and Irish libraries. Plan to digitise all CoI parish records and put them here. Irish Family History Centre, Whitefriars, Aungier St, Dublin. Lawrence Collection of photographs. NLI Flickr site labels these as out of copyright. Catholic parish records online. These are scans of microfilm of the originals. Not transcribed or indexed. King's Inns Admission Papers 1607-1867. Registry of Deeds Dublin abstracts of wills 1708-1832. Correspondence of Emily Duchess of Leinster. Search of many databases, including Ms in many Irish libraries. CSORP - Chief Secretary's Office Registered Papers. See introduction and 1818-22 index online. "Memorials of the Dead: Dublin City and County", vol.1-6, 1988-93, NAI open shelves. "Memorials of the Dead: South Dublin", 1990, NAI open shelves. NAI.VO - [NAI] Valuation Office records. 1840s surveys in preparation for Griffiths Valuation. Two indexes in [NAI] RR. Reports of the Deputy Keeper of Public Records in Ireland. Many lists of records that were burnt in 1922. 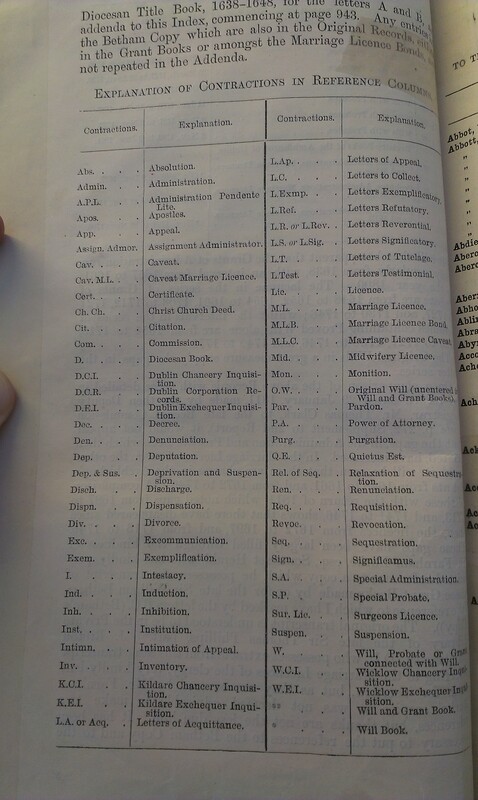 "Index to Dublin Wills", Appendix to 26th report of the Deputy Keeper of the Public Records in Ireland, 1895. See abbreviations. These wills were all burnt in the 1922 Civil War fire. Fisher Mss Will Notes A (Will abstracts 1680-1810, by Denis O'Callaghan Fisher, c.1859), [NLI] GO MS 139. Vol.1: A to J. See Blennerhassett. Research Room, Werburgh St, Dublin. Can order entries by post. Send letter with details and cheque. Can get digital copies sent by email. Births: 1864-1881, 1900-1913, most 1930-1932, most 1939. It is unclear what this is. Don't think any old material or old indexes are online. Historical archive - Registry of Deeds, Kings Inns, Henrietta St, Dublin. Does not have full deeds. Has short memorials (summaries) of deeds in basement as loose sheets. Can pay to view these. Has transcript copies of these short memorials in (easier to access) tombstone books in research room. Should be identical. [LDS Dublin] has microfilm of some material. LDS is putting these online. Long list of records. See RHS column for online scan of record. VO - Valuation Office, Irish Life Centre, Abbey Street Lower. Valuation Lists - Can track owner/occupant of all properties from [Griffiths Valuation] through late 19th - early 20th century. Substitute census for 1850 to 1900. Some VO books online at findmypast.ie (pay to view). UL - Library of University of Limerick. Archives (Special Collections). And here. Online databases that DCU is subscribed to. "Open in PDF Reader" - Save PDF. History of the Irish Parliament 1692-1800, 6 vols, edited by Edith Mary Johnston-Liik, 2002. [NLI] RR and Ms RR. MPs in Dublin, Edith Mary Johnston-Liik, 2006. [NLI] 7A 619. King's Inns Admission Papers 1607-1867. [NAI] RR. The 1798 Rebellion: Claimants and Surrenders. This CD is very hard to use: No original documents. No PDFs. Only transcripts in database. Need program to access database. Need to install program. Program only runs on Windows. To run program, need CD in drive each time. RCB - library of Representative Church Body, Churchtown, Dublin 14. Clerical and Parochial Records of Cork, Cloyne and Ross, William Maziere Brady, 1863-64. Church and Parish Records of the United Diocese of Cork, Cloyne and Ross by Rev. John Harding Cole (1903). Ardfert and Aghadoe Clergy and Parishes, 1940, [RCB] 274.15, [KCL] 941.96. The Church of Ireland in Co Kerry, by Janet Murphy and Eileen Chamberlain (2011). Also here. JMD - Journal of the Association for the Preservation of Memorials of the Dead. Glasnevin Cemetery (see here or via here), Dublin. Irish Historic Towns Atlas project. Some online. Previously the Royal Historical and Archaeological Association. Previously the old Kilkenny Archaeological Society. The Irish Ancestor, [RDS] RR. IRRS - Irish Railway Record Society. Library and Archives, Heuston Station. Entire BMD is online (index plus content). 1881 UK census transcripts are free (no images). Fire insurance maps - Detailed house-by-house street maps of Cork, Dublin. Can buy digital items online. CUST records (UK and Irish Customs records). See guide. Dublin Castle Records. CO 904 (and browse). This is produced on CD as "Sinn Fein and Republican Suspects, 1899-1921." Also on microfilm. Life and times of Sir Joshua Reynolds, Charles Robert Leslie and Tom Taylor, 1865. See vol.1 and vol.2. Has lists of sitters. Sir Joshua Reynolds: A Complete Catalogue of His Paintings, David Mannings, 2000. The Handbook of British Regiments, Christopher Chant, 2013 edn. Vol.1: 1661-1685, pub 1892. See contents and key to references. Vol.2: 1685-1689, pub 1894. See contents and key to references. Vol.3: 1689-1694, pub 1896. See contents and key to references. Vol.4: 1694-1702, pub 1898. See contents and key to references. Vol.5: 1702-1707, pub 1902. See contents and key to reference letters. Vol.6: 1707-1714, pub 1904. See contents and key to reference letters. 1804 edn. [NLI Ms] LO 4833. 1810 edn. [NLI Ms] LO 4837. British Army WWI Service Records, 1914-1920. About 60 percent of these were destroyed by bombing in WW2 in 1940. Steel's Royal Navy List, [NA.UK] RR. The Stall Plates of the Knights of the Order of the Garter 1348 - 1485, William Henry St. John Hope, 1901. Windsor Castle; an architectural history, by William Henry St. John Hope, 1913. Part 2. St. George's Chapel in Chapters 21 and 22 (pp.373-477). A History of the County of Berkshire: Volume 3 (1923) has chapters on Windsor Castle. Historical monographs relating to St. George's Chapel, Windsor Castle. Volume 1. The Knights of the Garter, 1348-1939; with a complete list of the stall plates in St. Georges Chapel. Edmund Horace Fellowes (1939). Volume 8. Fasti Wyndesorienses: the Deans and Canons of Windsor. Sidney Leslie Ollard (1950). Volume 12. The Monuments of St. George's Chapel, Windsor Castle. Shelagh M. Bond (1958). Volume 16. The Order of the Garter; its Knights and Stall Plates 1348 to 1984. Grace Holmes (1984). Alumni, pub 1922 and 1940. Alumni, pub 1886 and 1968. The Genealogist, [SOG] PER/GEN, [TCD] Research Area, Alcove 17, also available on microfilm from Primary Source Microfilm. Library is now at [SOG]. The Irish Genealogist (and search). [KCL] RR. [RDS] RR (temporary). Library and Family History Centre, Edinburgh. The following sites host user-submitted family trees. Warning: User-submitted trees may be nonsense. User-submitted trees vary of course from professional perfection to hopeless drivel. One has to treat each tree differently, and look into who the author is and how they work. Ancestry has a real problem with drivel because it is so easy to copy huge chunks of other people's trees. Bad trees get replicated and become impossible to get rid of. Barking Up the Wrong Tree laughs at some of the complete nonsense on Ancestry. Again, there is some terrific, professional stuff on Ancestry (and on these other sites). But nothing on Ancestry (or any of these sites) should be believed unless it can be verified. Order films to be delivered to local FHC. See help. 15th edn, 1974 to date, RR in all libraries. Spartacus Educational, online Encyclopedia of British History, by John Simkin. Un-proofread raw scans (change vol. no., and page no. at end): Vol.01 to Vol.63. "Brief Lives" by John Aubrey (set down between 1669 and 1696). 1898 edn, vol 1 (A-H). 1898 edn, vol 2 (I-Z). Thom's Irish Who's Who, 1923. A Compendium Of Irish Biography, Alfred Webb, 1878. 100 Irish Lives, Martin Wallace, London, 1983. Louis McRedmond (ed), Modern Irish Lives: Dictionary of 20th-century Biography, Gill and Macmillan, Dublin, 1996. A Biographical Dictionary of Irish Writers, Anne M.Brady and Brian Cleeve, 1985. Tipperary's Families: Being The Hearth Money Records for 1665-6-7, ed. Thomas Laffan, Dublin, 1911. The originals were burnt in 1922. Transcripts for Co.Tipperary exist, but not for Co.Limerick. Ordnance Survey of Ireland: Letters, 1834 to 1841. [VO] has text and maps, to view on-site. text and maps at findmypast.ie (pay to view). For all the above, the maps need to be cross-checked to multiple plots. Sometimes plot numbers in the map do not match the text. Handran's Townlands in Poor Law Unions. "The Landowners of Ireland", Hussey De Burgh, 1878. The censuses for 1821, 1831, 1841 and 1851 were burnt in 1922. The censuses for 1861, 1871, 1881 and 1891 were destroyed for other reasons. The censuses for 1901 and 1911 survive and are public. Next one to be public will be 1926 census in 2026. Census 1901 and 1911 are online. This was an early CD that is very hard to use. You have to go through a program rather than having the data as PDF files that you can browse. The program is old (pre-Windows XP). Tip: Never click "Back". Always click on menu item to return to search results. Clicking "Back" leads to a reload to a previous state. Tip: To link to page: "Share on Twitter" has permalink. Irish newspapers at findmypast.ie (pay to view). Apparently also has transcribed par records from Killarney area. John Hayes - various indices online. Guardian and Observer archive online since 1791. Beranger's Antique Buildings of Ireland, ed. Peter Harbison, 1998 (reproduces the 18th cent. prints of [NLI] Ms 1958 TX). Cooper's Ireland (drawings of Austin Cooper), Peter Harbison, 2000. See Cooper Collection at [NLI]. Francis Grose, The Antiquities of Ireland, 1794. Daniel Grose, The Antiquities of Ireland: A Supplement to Francis Grose, ed. Roger Stalley, 1991. Ireland in Pictures, The Hon. John F. Finerty, Chicago, 1898. Georgian mansions in Ireland by Thomas U. Sadleir and Page L. Dickinson, 1915. Guide to the National Monuments of Ireland, Peter Harbison, 1970. In Ruins: The Once Great Houses of Ireland, Simon Marsden and Duncan McLaren, 1980, revised 1997. A guide to Irish country houses, Mark Bence-Jones, 1988. 2nd edn 1990. This was previously Burke's Guide to Country Houses: Volume 1, Ireland, 1978. Irish Castles, David Pritchard and Liam Blake, 1993. Great Irish Houses, Irish Georgian Society, 2008. The Irish Country House, by Desmond Fitzgerald, 29th Knight of Glin and James Peill, 2010. The Gate Lodges of Munster: A Gazetteer by J.A.K. Dean (2017). The old Burke's Peerage Ltd went out of business. Burke's Peerage and Gentry are their rightful successor - the ones who are producing new editions of the works. See discussion here and here and here and here. Reprinted as Burke's Authorised Arms, 1971. Armorial Families, Arthur Charles Fox-Davies. Royal Highness: Ancestry of the Royal Child, Sir Iain Moncreiffe of that Ilk, London, 1982. Royalty for Commoners, Genealogical Pub. Co., Baltimore, 3rd edn, 1998, [SOG] P/R/GEN. Melville Henry Massue, styled "Marquis of Ruvigny and Raineval". The Blood Royal of Britain, 1903-11, repub 1994, [CUL] R493.12, [ECL] WCS 418 (RR). These volumes list all descendants of Edward IV and Henry VII and James III, King of Scotland and Edward III. Titled Nobility of Europe, 1914, [TCD] Research Area, Stall 91. 2nd edn, 1876. [NLI] 9291 b 5 Offsite (Special Access). [CUL] Z496.b.87.1. 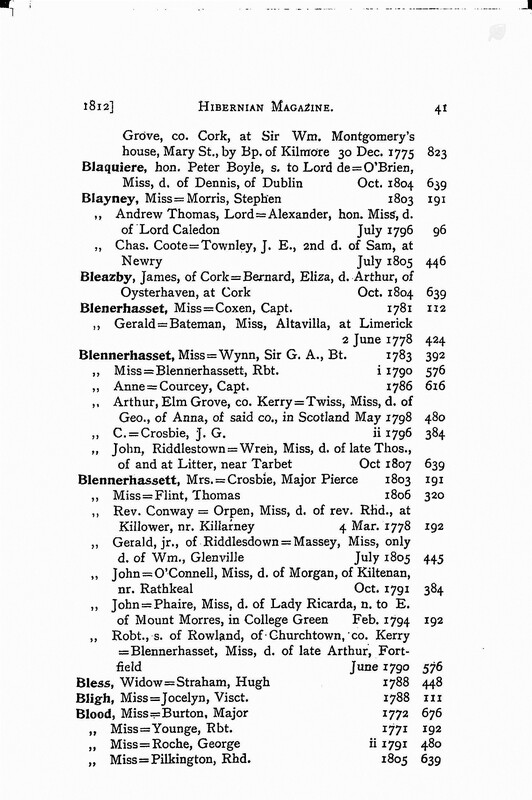 Indexed in: Index to Family Names appearing in Burke's Royal Families, A.G.C.Fane, 1932. [CUL] R493.10. 1858 edn online. Also here. Vol.1, 1883 See contents. See also partial copy. New Extinct Peerage 1884-1971, Leslie G. Pine, 1972. Burke's Irish Family Records, 1976, [NLI] RR Ir 9292 b 36, [GO] RR, [TCD] Research Area, Stall 91, [Dundrum Library] REF 929.72, [KCL] RR 929.4, [CUL] Ref.23.35 (else L496.b.17.5), [NLS] 929/2/09415 Biog.D.26.2.B3. Irish Families, Edward MacLysaght, 4th edn. 1985. The Tipperary Gentry: Vol 1, William Hayes and Art Kavanagh, 2003. Sources for Irish family history, James G. Ryan, 2001 [bibliography of Irish family histories]. Miscellanea Genealogica et Heraldica. [NLI] 92905 m 1 (offsite, order in advance). Vol.1, 1868. (This is vol.1 plus truncated vol.2.) And here. And here. And here. John O'Hart's work is full of myths - Adam, the Deluge, Milesius, and so on. The mythological segments rather cast doubt on his work on later periods. O'Hart needs to be cross-checked. But some of his later (17th-19th century) pedigrees may be good. Irish and Anglo-Irish Landed Gentry, 1884, repub 1969, [Dundrum Library] REF 929.2. Ancestors of American Presidents, 1995. The Royal Descents of 500 Immigrants to the American Colonies or the United States, 1993. Editions in 1980, 1981, 1989, 1993. Thom's Directory in the NLI.